All of the stories and details behind SoultreeSurf brought to you by Jesse and Ryan. I am not an expert on stand up paddle boards. I am not even good on one (yet). I am way into it though. You can have fun on them in 18 inches of water in any part of the world. 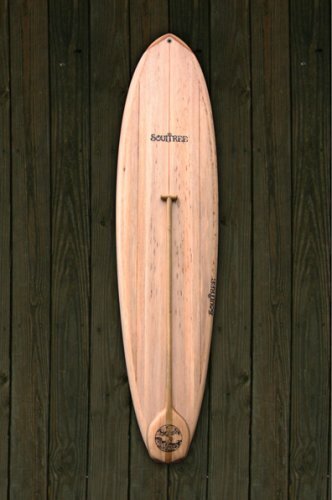 On a really hot sunny Sunday morning in early August, I placed a new 9′ 11″ Soultree Stand Up Paddleboard on a pair of old saw horses in my driveway. It was freshly polished and radiating beams of light. The grain of each balsa board was distinguished by the golden mahogany stringers. My son Ryder and I opened up a new Dakine traction pad kit that I purchased from Noreaster’ Surf Shop in Scituate, MA. You only get one shot to put the puzzle of pads on perfectly and after 30 tedious minutes, we nailed it. That afternoon, I embarked on an awesome journey around Powder Point in Duxbury, MA. Like a modern day version of Columbus, I took off from the town landing adjacent to the bridge on Washington Street at the mouth of the Bluefish river. The tide was just starting to come up and there was plenty of cloudy blue/green water. The first thing you realize when you are on a Soultree board is that is feels and sounds more like a watercraft. The hollow chambered balsa wood makes a very pleasant sound as waves slosh into the sides of it. A constant “whoosh….. whoosh…..whoosh……” It’s sturdy and gives you confidence under your feet. You just need to provide the core strength and balance. As I navigated out of the Bluefish River, I turned and headed along the south side of Powder Point. To my left was the shore line where there were kids swimming and jumping off docks. To my right there were at least 200 Sunfish boats being sailed by teenagers. They looked like moths swirling around each other. I worked my way through a maze of moored off Bayliners and Grady Whites. About halfway out, I ran into a bit of a cross wind and the swells picked up. My mind began to focus. I thought, “Bend your knees going into the top, then down the face, extend your legs, back to the top, and repeat….” I got this….but the real challenge, as you seasoned paddleboarders know is when the swells are going from side to side…. That’s when I got wet, several times… An hour into it, I finally made it to the point and to the famous Powder Point bridge. I know this water very well. When the tide drops, you can dig clams forever. Quahogs, Littlenecks, Steamers, Razors, Mussels…. It’s the same water that the legendary Island Creek Oysters are grown in. It’s among the most picturesque waterscapes in Massachusetts. I headed north under the bridge. That’s where I picked up an air force of green heads. I must have been some sight to the people watching me from the beach. I was swatting my neck then swatting my leg then swatting my arm then repeating that cycle…faster and faster. This time, I got wet and there was no swell. I was in the drink and under attack. What biological weapons plant were green heads created in. They seriously have alien eyes and razor teeth. After my harrowing escape I proceeded along the north side of the point. There must have been twenty herons and twice as many egrets out there. I saw a mother hen turkey with six juveniles behind her in a patch of reeds(what the hell is a flock of turkeys doing out in the middle of the bay?) As I got closer to the shore, I could see deer tracks in the tidal mud(they have evolved). There was no sign of striped bass though. Everything else in the wild was present today except the fish. Still a bit too early for their run. I made my way all the way back towards the main land just as high tide was coming up. I was about 2 hours into my trek and I headed back. The wind had changed slightly and now was out of the west. That made my paddling back towards the Powder Point bridge much easier. I dreaded going back under because of the green heads. I gritted my teeth and tried to gain as much speed as I could to get by there. Mysteriously, they were gone. I kept waiting for the bites but they didn’t come. It was now mid afternoon and there were boats all over the bay. Some were dragging tubes behind them at blazing speeds. Others were carrying leisure seeking people dressed in white. The sun was blasting through my SPF50 and my sunglasses were covered in dried salt water spots. I finally got back to the mouth of the Blue Fish River and the water was the calmest that it had been all day. It was serene and peaceful. As I made my way towards the town landing, I could see fifty kids lined up on the bridge, all waiting for their turn to plunge down into the river. It’s one of those traditions that you see all through New England. Right next to ice cream and lobster rolls. By this point, there were a dozen boats hanging out there watching this event and creating a scene. I paddled back up to the dock then pulled the board up and out. A boat full of 40yr oldish party people wanted to know all about the SUP and my voyage. They offered me a can of Harpoon Summer and we talked for about 30 minutes. After we parted ways, I loaded the board on to the truck and got in line for my first jump ever from that bridge. On the ride home, My head was super clear and my body was tired. I started thinking about the crossing of Cape Cod Bay. The 34 mile paddleboarding trek from Mainland Massachusetts to Provincetown(Cape Cod) to raise money for Christopher’s Haven. Friends who have done it say it takes around 10 hours with the right conditions. It’s not a race. It’s a group challenge and you can find more details here- http://capecodbaychallenge.memberlodge.com That would be one heck of a paddle. An incredible accomplishment for anyone that has completed it.